Can you name (in eight letters) a coastal town to the north-west of Jerusalem? Do you know what was cast up by the troubled sea in Isaiah 57 (four letters)? And what is it that the eighth commandment forbids us to do (five letters)? After the success of Three Down, Nine Across, we bring you Quick Bible Crosswords, a collection of 80 Bible-based, non-cryptic puzzles previously published in The Church of England Newspaper. This book is an excellent gift book for Christian crossword-enthusiasts and a great resource for small groups looking for a new way in to Bible study. Puzzle grids are on the right-hand page for easy completion, and answers are listed at the back of the book. 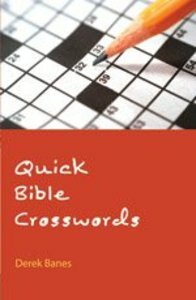 Quick Bible Crosswords is ideal for Christians who like crossword puzzles (late teens upwards), as well as those who bought Three Down, Nine Across (BRF, 2008). Youth and small group leaders wanting a fun resource to get people into the Bible will also find it useful. Can you name (in eight letters) a coastal town to the north-west of Jerusalem? Do you know what was cast up by the troubled sea in Isaiah 57 (four letters)? And what is it that the eighth commandment forbids us to do (five letters)? After the success of Three Down, Nine Across, we bring you Quick Bible Crosswords, a collection of 80 Bible-based, non-cryptic puzzles previously published in The Church of England Newspaper. This book is an excellent gift book for Christian crossword-enthusiasts and a great resource for small groups looking for a new way in to Bible study. Puzzle grids are on the right-hand page for easy completion, and answers are listed at the back of the book. Quick Bible Crosswords is ideal for Christians who like crossword puzzles (late teens upwards), as well as those who bought Three Down, Nine Across (BRF, 2008). Youth and small group leaders wanting a fun resource to get people into the Bible will also find it useful. Derek Banes has been compiling crosswords for The Church of England Newspaper since 1998. After more than 30 years as an engineer for the Marconi Company, he took early retirement and started spending more time puzzle-setting and solving. In his spare time, he is a great fan of test cricket, Southend United FC, and is involved in amateur dramatics and operatics.